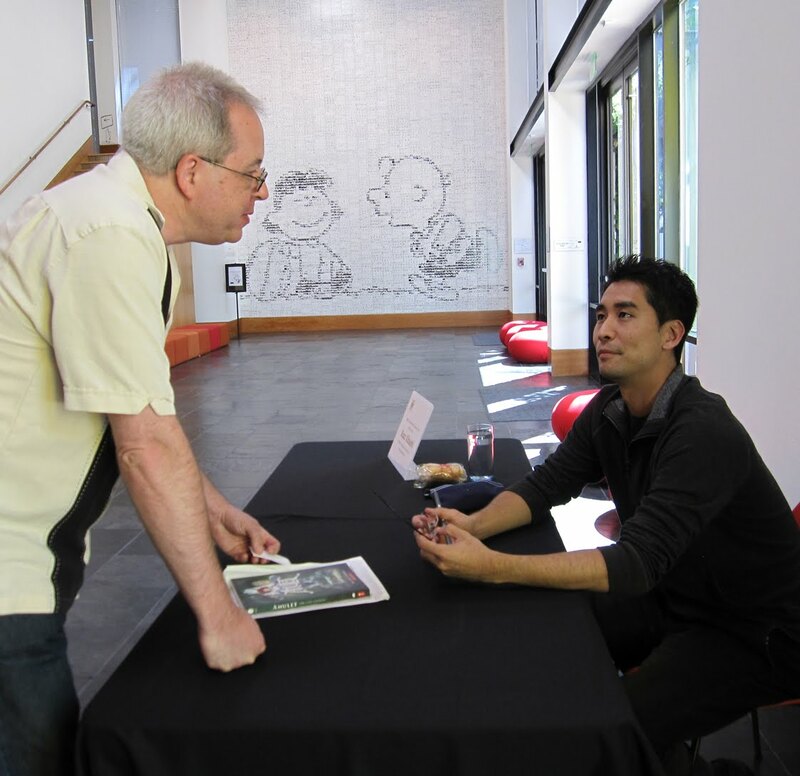 Karen and I went to the Charles M. Schulz Museum this afternoon to see Kazu Kibuishi, creator of the bestselling Amulet series for kids, the well-regarded Flight anthologies, and one of the sweetest little webcomics ever, Copper. I'd never met him but I know a lot of people who know him. It's a small world. Me: "I'm really happy to meet you. I'm Brian Fies, I did a couple of books called Mom's Cancer and Whatever Happened to the World of Tomorrow." Kazu: "Oh! I know Charlie!" "Charlie" is of course my Editor Charlie Kochman, whom I've joked before knows everybody in the business and gets treated like the Godfather at a Sinatra concert when he walks the aisles of Comic-Con. I'd forgotten that Kazu recently signed with my publisher Abrams to produce a new anthology titled Explorer, edited by oh you know who. Still, the fun of everyone I meet saying "Oh, I know Charlie!" is wearing thin. Normally I'd hate someone so much more talented, successful and younger than me, but Kazu gave such a warm, authentic, interesting, unassuming talk that I can't bring myself to whip up more than a mild envious resentment. In addition, he and I seem to have similar philosophies about what comics can be and how they should be made (I've said some of the same things in talks I've given) that I almost feel I found a brother. A more talented, successful, younger brother. Since I was at the head of the line waiting for autographs, we only had a minute to talk. I hope I have a chance to really sit down and spend some time with him someday. Just noticed that I compared two different people to the Godfather two posts in a row. I stand by my characterizations. It's an East Coast/West Coast thing. The Marmaduke's head in the bed thing was inspired. Creepy, but inspired. I'm really sorry that you had to endure meeting someone who is "more talented, successful, younger" than you. That's never happened to me, at least not that I haven't intentionally forgotten as quickly as possible. I like to think of you as the more talented, successful, younger person I've run into. Thank god I'm still better looking! Sherwood and Mike are both extremely handsome men. They are! But I regret to report that Charlie is more handsome than the lot of you. (Not "put together", as that would be cruel.) As is, I'm afraid, Kazu Kibuishi. Who is positively hot. But you're all much more entertaining, and I love you all much more. So there's that. Gosh, what can I say, Ronnie? Kazu is an amazing talent and I am proud to be his friend. Alas, I'm not his editor. That honor goes to Sheila Keenan. She's the editor of EXPLORER, Kazu's latest anthology masterpiece, which I am thrilled to have on our list. Correction made! Sincerely sorry for the confusion, which was all mine. Kazu's pretty good, but I'd appreciate it if you'd reserve the word "masterpiece" for work that truly deserves it. Like mine. Or Kinney's. Never mind Ronnie. She's just angling for a book deal.